Virginia Tech cadet Donald Warter will receive the flags at this week’s football game against Pittsburgh. 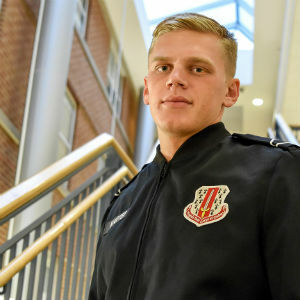 Warter, a sophomore majoring in financial accounting in the Pamplin College of Business, was chosen for consistently exceeding expectations as a cadet. He works with a positive attitude and is constantly looking to improve as a leader by taking initiatives and adapting adversities. His leadership style has let him excel both in the corps and the Naval ROTC. He is the recipient of an Emerging Leaders Scholarship.